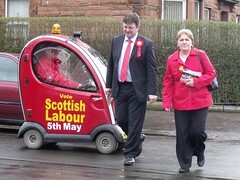 What is Lamont doing to Scottish Labour? A council tax freeze, for example, costs. It’s cheap to say, but expensive to fund. And if you don’t fund it properly, and John Swinney isn’t funding this one, I’ll tell you what it costs. In North Lanarkshire alone, another 1400 jobs at risk. […] That is potentially 1400 incomes taken out of the economy. When the Scottish economy desperately needs a stimulus, that is 1400 people spending less, supporting fewer jobs, buying fewer goods and services. This is the stark choice that Scotland has to face up to: if we wish to continue some policies as they are then they come with a cost which has to be paid for either through increased taxation, direct charges or cuts elsewhere. Because she’s a committed unionist, increased taxation is not the way she wants to go (it would increase, not decrease, Scottish exceptionality), and she’s just condemned the cuts. She’s therefore left with direct charges — she wants to abolish free care and bus travel for the elderly, introduce tuition fees and prescription charges and end the council tax freeze. In other words, she’s abolishing Scottish Labour’s commitment to universality, which is strange, given that Labour in the UK and in Wales are still in favour of universal benefits. [U]niversal public services, to which all contribute and from which all benefit, are the essence of social democracy. Once this principle is abandoned, greater cuts will inevitably follow as the rich, no longer receiving, have less incentive to give (you could call it “nothing for something”). For this reason, as Richard Titmuss sagely observed, “services for the poor will always be poor services”. There are different analyses of her motives. My first reaction was that she’s trying to secure the votes of public sector workers, especially in local councils and in the NHS, who are fearful of their jobs and would rather that everybody else paid more in order to secure their jobs and generous pensions. I tried to think who in Labour would like this. I concluded that Westminster Labour would be very happy. So local-government-Labour will like it and Westminster-Labour would like it. And that is two thirds of Scottish Labour’s warring factions. If – and it seems a big if to me – Scottish-Parliament-Labour can be persuaded that this is good for them, it solves Ms Lamont’s short-term problems, uniting the three warring factions of her Party. Lamont wants to unite Labour by cancelling devolution. That’s the only way I can read this. She has systematically gone through every area where the Scottish Parliament (largely through the actions of Labour itself) has differentiated itself from Westminster politics and she has abolished the differentiator. The big selling point of devolution was Scottish solutions to Scottish problems. Scotland’s biggest problem has been that it really likes a strong welfare state and adheres to the principle of universalism. It has voted this way over and over. Yesterday it seems that Lamont called time on this experiment. She has signalled her intention to pull the party in line with the UK Party, means testing everything, breaking down universalism, championing fiscal conservatism. It is like she has absorbed so much ‘Better Together’ rhetoric that it is now her defining belief in politics, that Scotland must be pulled into Britain, that Labour must become first-and-foremost unionist. It is a retreat into two comfort zones from different decades. From the late-1990s she takes Blairism which was superficially effective (although not in Scotland). From the 1980s she takes a model in which the real power of Labour is held in two places – Westminster and local government. Both are fantastical memories of times past, neither seem to me to offer a way forward. Much as this strategy might appeal to Labour apparatchiks and many of their core voters, I simply can’t see how it will help them win either the referendum on Scottish independence or the next elections to the Scottish Parliament. Author thomasPosted on 2012/09/26 2012/09/26 Categories en, politics, scotlandLeave a comment on What is Lamont doing to Scottish Labour?